It all started when my brother Kuya Erson from California started asking me to get him Mugs for his Mug Collection. As all of my friends know well, I am a die hard Collector. Collector of Collections! I have so many collections! From Pictures, Immigration Stamps, Maps, Books, Wine Bottles, Landmark Figurines and so much more! So when I was rummaging my closet for things for my travel journal, I suddenly saw a Starbucks Paper Bag with something inside, the Hong Kong Starbucks mug I bought for my Kuya (but never arrived to him) on my trip to Hong Kong, Victoria Harbour and saw how beautiful it looks! 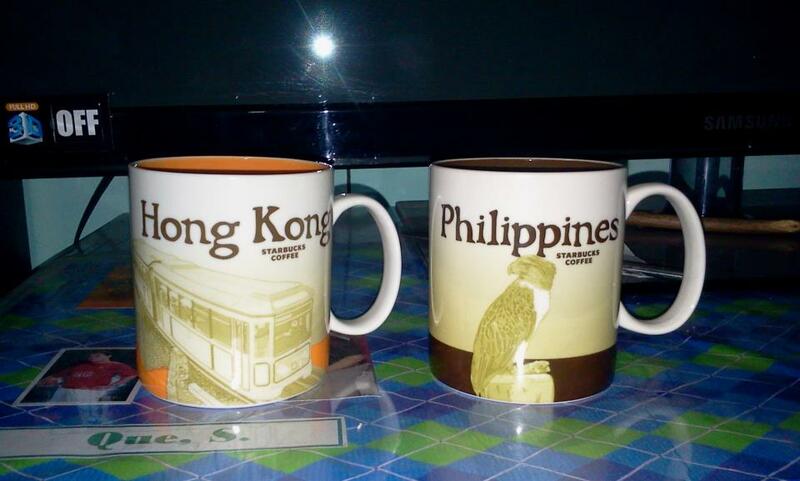 I always see these mugs whenever I get coffee at Starbucks Branches but when I started staring at it , I realize how nice it looks and how beautiful to collect these mugs of the same format, same size with different designs of cities and countries! So on that day I decided to make it my first piece to my own collection of the Starbucks Global Icon Mugs. Then at Christmas Day, I went to Starbucks in the newly opened mall in the City of Imus, the District and I got my second mug, Philippines! The STARBUCKS HONGKONG mug features the Historic HongKong Peak tram at the front and at the back, the breath-taking view of the HongKong Skyline at Victoria Harbour. You can see my list of Mugs at the upper right side of the Sidebar by clicking on the Starbucks mermaid Image!